We are back from the Healthcare Design Expo and Conference in Phoenix! We met so many people and listened to a number of workshops and talks, but for those who missed this year’s conference, or as a reminder to the attendants, we wanted to share our highlight: The opening keynote speaker Ingrid Fetell Lee. Her speech shared the extensive research on the aesthetics of joy, and its applications within healthcare design. For our team, Ingrid’s speech was the most captivating and relevant towards our development as manufacturers of interior products. We thought we would give you an overview of the talk and show you how we have been inspired to add more joy to the products we offer. Ingrid Fetell Lee is a designer and founder of The Aesthetics of Joy, former design director at Ideo, and author of ‘Joyful: The Surprising Power of Ordinary Things to Create Extraordinary Happiness.’ Her speech focused on the way physical environments can potentially affect our well-being. Beginning with an excellent example of Tirana, Albania. A city which was in a desolate state of high crime rates, rubbish filled streets and no money to repair the damage. In 2000, a newly elected Mayor Edi Rama took a small amount of funding for Historic Preservation and painted vibrant designs and colours on the cities buildings. The city slowly came back to life after a period of deep decline. The citizens stopped littering, businesses began to open and crime began to decline. It was a joyful revival, the city became the inspiration for the people to thrive. This story echoed with an experience Ingrid had at a review in her first year of design school, when a professor made an offhand comment of her work: “Your work gives me the feeling of joy.” How could a word which is fleeting, intangible and ephemeral, describe such ordinary objects and what had evoked such a feeling. 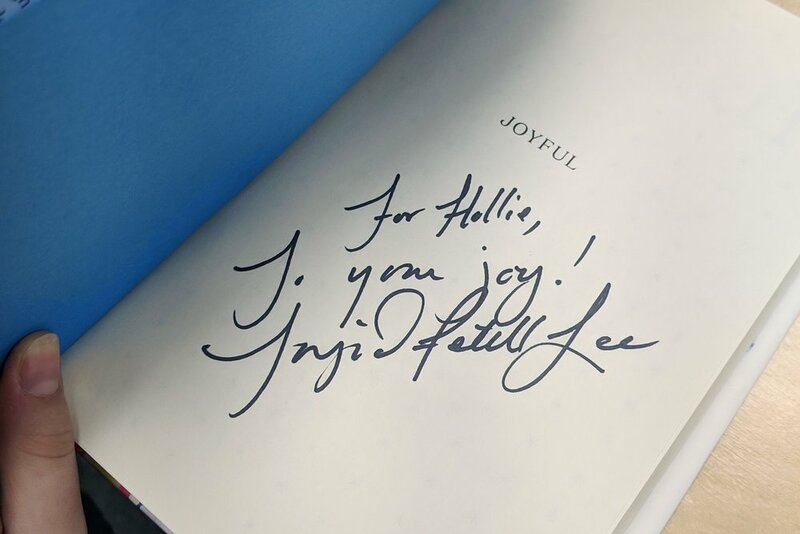 Through this connection between her work and joy she discovered a breadth of research that demonstrated the link between our environment and our well-being, that joy has the potential to change the way we feel physically and emotionally. Ingrid laughingly describes how she started her exploration of joy by asking a number of strangers: What brings you joy? Collating answers like sunsets, sandcastles on beaches, candles on birthday cakes and rose gardens. Discovering that though the feeling of joy is ephemeral, we can access it through physical things. Designers use the term aesthetics - the properties that define the way an object looks and feels. She quotes Florence Nightingale, who often talked about the effect of variety on illness. That monotony is the deadliest thing for patients. As designers we have pushed form over function, aesthetics to being subordinate to the function, especially in healthcare. Ingrid however has found that deprioritising aesthetics left joy out of design, that form and function should be balanced in design. Often the physical world has little or no impact on our inner joy, which seems strange in a healthcare space which we can spend a considerable amount of time recovering in. These environments are typically minimal settings to maintain cleanliness and sterility, but in this they can lose their joy. 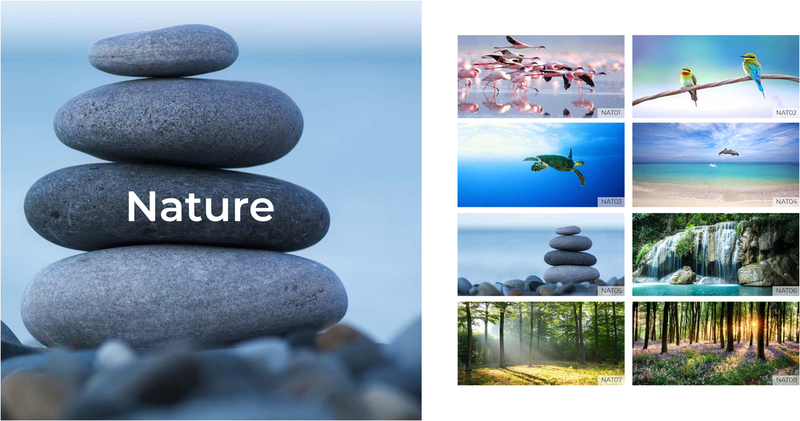 In her talk, she focuses on three of her identified aesthetics of joy - ten categories which have distinct connection with the feeling of joy and tangible qualities - to help inspire the way we should be designing healthcare spaces: Energy, Abundance and Freedom. With each word she presented examples of spaces changed from an injection of joy. Publicolor at Frederick Douglas Academy in Harlem. Publicolor is the nonprofit launched by Ruth Lande Shuman, who became aware that middle schools in East Harlem resembled prisons. 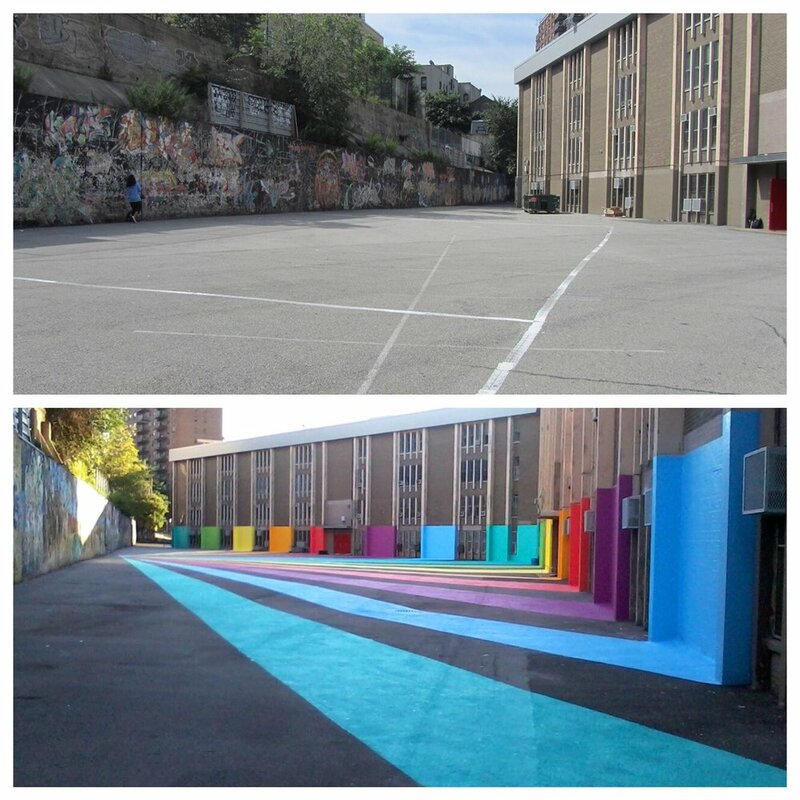 She decided to transform these underserved New York City public schools with bold, vibrant paint. The effect of this? The perception of the space changed, the danger began to dissipate and a more focused environment was created. Here in the UK we have a similar organisation Global Street Art, which exists with a mission to live in painted cities. Working across the UK and worldwide on projects with councils and other public bodies. For example: Their Art for Estates program is a new initiative which aims to increase the amount of public art on London's housing estates. Organising over 30 murals in one Chalk Farm Housing Estate in Camden! At KwickScreen we do the same to hospitals, with large format vibrant printed partitions, that Global Street Art and Publicolor do drab city spaces. Global Street Art, Our Art for Estates Programme. Referencing Energy, the Nature collection from our catalogue. Emmanuelle Moureaux renovation in Shinjuen Nursing Home, Kawagoe-City. Emmanuelle Moureaux, a French architect uses the principle of abundance when designing her spaces. An example presented by Ingrid is her renovation of a care homes visitor area, where she added vibrant colours and confetti like artworks. After the renovation, they found the families who visited the residents stayed longer; becoming an inviting space of comfort and healing for both patients and staff. Referencing Abundance, one of the Children’s collection from our catalogue. Roger Ulrich conducted a seminal study in 1984 of gallbladder patients, looking at their well-being in relation to their environment. In the study, some patients rooms had a green view while others had a brick wall. He found the patients with the open view healed faster after surgery and needed less pain medication compared to the other patients, their sensory experience had a direct effect on how they felt physically. Referencing Freedom, the Landscapes collection from our catalogue. A presentation slide from Ingrid Fetell Lee’s speech at HCD Expo, Phoenix. Michael grabbed a selfie with Ingrid after her speech! Ingrid signed a copy of her book for us. The KwickScreen team who ventured out to Phoenix have come back inspired, and with a signed copy of Ingrid’s book! What we felt most prominently about Ingrid’s talk was the effect patterns, texture and colour have on people, such as the patients, staff and families. Here at KwickScreen we manufacture flexible partitions to solve privacy and isolation issues. The products are unique in that they offer a hygienic surface suitable for all healthcare environments, with a large surface area for high quality printed imagery. Previous screens have featured landscapes, block patterns and corporate branding; to introduce images into the most intimate of healing spaces. We hope so far we have created some joyous spaces. We were so energised by Ingrid’s speech that we felt you should at least have a taste of the stories she shared, and definitely suggest reading her book! There is a deeper look into each of her ten aesthetics of joy, as well as helpful tips to apply to your own area of design. It was a pleasure to be boosted at the beginning of the conference, and to see that there are a variety of colour, pattern or textures that cane bring joy to the most difficult of spaces! We’ve also decided to curate a more joyful collection in our image catalogue, in honour of becoming more joyful! We hope to surprise you with it soon! If you want to check out Ingrid’s speech, watch the video above. Or check out her TEDTalk below, for further information about The Aesthetics of Joy. And we would definitely recommend buying her book Joyful: The surprising power of ordinary things to create extraordinary happiness.